This is the season of new life, of blossoming, of growth! Whether you are looking forward to Easter, or Passover, or are just someone who lives in awareness of the changing season, one cannot help but be moved by the amazing array of colors and smells that come with the Spring season. At Tyler's Pizzeria and Bakery, we are no match for Mother Nature and her grand array, but we too provide a delicious assortment of tasty treats and savory dinners that also come with great smells and colors! Be sure to check out our Lenten Special and our Holiday menu (shown below in yellow) for the upcoming Easter and Passover weekend, and get your orders in as soon as possible. Three Cheese Pizza: Hand Shredded Mozz./Cheddar/Fresh Mozz. Our pizza is baked in our wood burning stone oven. Our baked goods are made from scratch and baked fresh every day. We invite you to join our mailing list to receive updates information throughout the year. 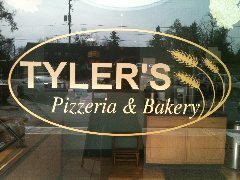 Your information is safe with us and we will only use it to send you information about the Tylers Pizzeria and Bakery. 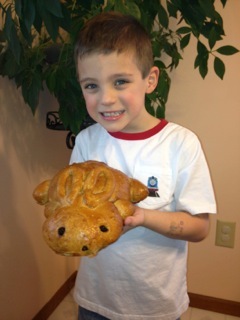 Tyler's Pizzeria & Bakery - home of the wood fired oven! Open Tuesday through Friday, 11:00 AM - 9:00 PM; Saturday, 9:00 AM - 9:00 PM. Pizza making begins around 2:00 PM each day. Site designed and managed by Assist By Evans.